The Reds are back in action after the international break as they host Tottenham Hotspur in the Premier League at Anfield as the search for a first title in 29 years resumes. 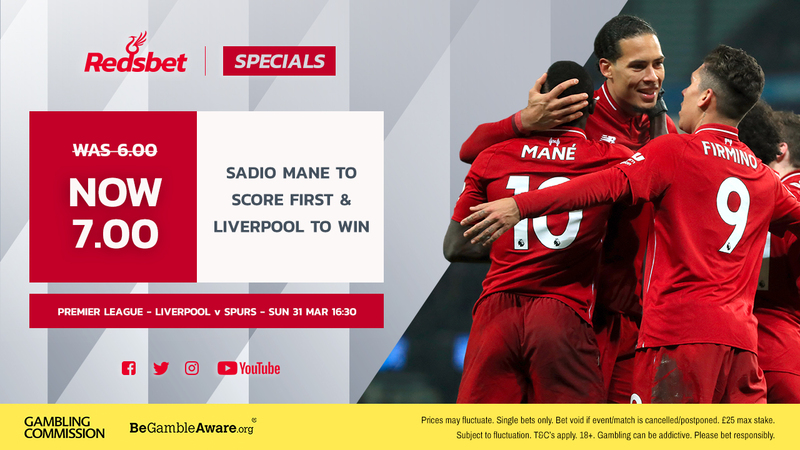 One of the toughest games left in the run-in for Liverpool will see Jurgen Klopp come up against Mauricio Pocchettino at 4:30pm on Sunday and Form Labs are here to provide our betting preview for the crucial clash with their top tip for the game. You can get on our range of enhanced odds for the game on site or by going through one of the links below. The international break came at the right time for Spurs as they’ve gone W1-D1-L3 over their last five fixtures across all competitions, while on their travels they’ve lost five of six games now with each defeat ending either 2-1 or 2-0. By contrast, we appeared to overcome our indifference at the sharp end to win our final three against Burnley, Bayern and Fulham as we racked up nine goals. That temporary inability to carve out or finish chances may have put us on the back foot when it comes to the title race, with City possessing the game in hand, but home form remains solid and we’re unbeaten at Anfield in the league since the start of last season. That includes 13 wins from 15 outings this term, as we’ve netted at least three times in seven of our past eight, and so we’re not unduly concerned in that department. Today we’ve confirmed that ticket prices for the 2019/20 season will be frozen. Mauricio Pochettino is not doggedly wedded to any formation and has often switched between using a back three and combinations of 4-3-3, 4-2-3-1 and the midfield diamond this season. Jurgen Klopp may be a little more rigid, only really using 4-3-3 or 4-2-3-1, but both coaches are fervent disciples of the high press. That should certainly suit our boys more with Spurs’ squad racking up the air miles over the international break as their 16 players in action managed 61,883 while our 13 involved clocked just 33,977. That’s a massive 82% more for Pochettino’s men, and with home support behind us, a high-octane clash should leave an element of tired legs for the visitors by the later stages on Sunday afternoon. Trent Alexander-Arnold will have been disappointed that a back injury prevented him from adding to his five England caps, but it has at least given the 20-year-old some much need rest following a hectic schedule, though it remains doubtful whether he’ll be fit in time to start here. Joe Gomez has stepped up his rehabilitation but it’s too early to throw him back in just yet, meaning ultimate utility man James Milner may find himself playing at right-back again. Xherdan Shaqiri and Naby Keita both face fitness tests but are expected to make the bench (where they would have started in any case against Spurs), while Jordan Henderson was fit enough to start for England against Montenegro and should feature from the off. As previously mentioned, Spurs have really struggled on their travels of late. However, that has been a consistent theme of Pochettino’s time at the helm when visiting fellow ‘Big Six’ outfits. His side have gone W3-D7-L13 in such clashes, including a W2-D1-L5 record from eight such games since the start of last season, while home or away, that latter record is replicated this term alone. Combined with our exceptional home form in recent times, we’re feeling quite bullish about our chances of remaining top of the league following the weekend’s action, but we’d like to couple that with a goalscorer. Sadio Mane has really led the charge over the past couple of months with 11 goals in as many games, netting the opener in over half the games where he found the net, while he took that form into the international break as he netted against Mali. Mo Salah may well still be top dog amongst our attackers in the grand scheme of things, but which man is enjoying the better form at this moment in time is simply not in question.